Our K9 choice brand Melatonin for dogs contains 180 tablets of 5 mg melatonin. Melatonin is naturally produced by the body in the pineal system and supplementing with melatonin can be highly beneficial. 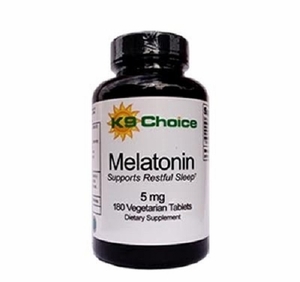 Melatonin has been reported to be an immune system booster. Melatonin is a well known antioxidant and research has indicated that Melatonin supports the endocrine system in dogs when used in conjunction with lignans. Melatonin is often used with lignans to help lower cortisol levels in dogs with Cushing's Disease. Melatonin for dogs can be beneficial because it is known to inhibit two enzymes needed in the production of cortisol (the stress hormone). Melatonin blocks aromatase enzymes and reduces hydroxylase enzyme. This effectively lowers heightened cortisol levels in dogs with Canine Cushings Disease. Many of the symptoms of Cushings Syndrome are a result of elevated cortisol levels. Managing hormone levels can aid in managing the symptoms. Many believe that melatonin is used to help dogs with Cushings sleep better. While this may work in some cases, the primary function of the melatonin treatment option is the reduction of cortisol levels, which in turn better manages heightened stress hormone levels in dogs with Cushing�s and helps to control Cushings symptoms. Reports on melatonin for dogs with Cushings have shown that the Cushingoid dog can become less lethargic. Most dogs acclimate to melatonin within a couple weeks and return to normal sleeping and activity levels. If this is not the case, it is recommended to consult a vet to determine if melatonin is the best option. Note:Always consult your physician or veterinarian before taking melatonin for yourself or your dog. According to Dr Jack Oliver, DVM, you should not use a rapid release melatonin or a timed release melatonin. Regular melatonin. All of our melatonin fits these criteria.